State Rep. Randy Terrill, the outspoken anti-illegal immigrant fighter who now faces a felony count of bribery, projects an image of Oklahoma that can only be damaging to long-term economic development and population growth here. Terrill (R-Moore), pictured right, has become a figure on the national political stage. On Wednesday, he appeared at a Washington press conference as part of an effort by State Legislators for Legal Immigration to force federal judicial rulings on the 14th Amendment, which grants citizenship to people born in the United States. Terrill called it the “holy grail” of the movement to fight illegal immigration. The group is against automatic citizenship for foreign nationals. All this is nothing new for Terrill, of course, but what has become apparent is that he has become a major face of Oklahoma the state could do without. Just a cursory Google search shows Terrill has been mentioned recently by prominent media outlets, including The New York Times and The Washington Post. Terrill’s remarks make the state’s residents seem intolerant, xenophobic and unwelcoming. Try selling that to companies considering relocating to Oklahoma. In 2007, Terrill sponsored draconian anti-illegal immigration legislation that became law in Oklahoma. He now wants to push legislation this year-apparently with the blessing of Gov. Mary Fallin-that would be modeled after Arizona’s tough new anti-illegal immigration law, which some legal experts argue legalizes racial profiling. A federal judge blocked some provisions of the law last summer. Outspoken and unapologetic, Terrill obviously strikes a chord with many Oklahomans, but regardless of how one feels about illegal immigration, it should remain a federal issue. Both Republicans and Democrats have failed to find a solution to the problem. The GOP, in particular, has fractured over those Republican politicians who welcome a cheap labor pool and those like Terrill who favor arrests and deportation. Complicating Terrill’s image right now on the national level-and this is not good for the state’s image either-is the felony bribery charge he faces. The charge alleges Terrill tried to arrange a deal in which former state Sen. Debbe Leftwich, a Democrat, would get a state job if she declined to run for reelection. Leftwich has also been charged in the case. Terrill calls it “political persecution” and “hyper partisan” on the part of Oklahoma County District Attorney David Prater, a Democrat, but there’s a lot lacking in that argument. Leftwich is a Democrat, for example, and Prater had to act on information he received about the case. To ignore information about a potentially criminal act is a dereliction of a prosecutor’s duties. There is no evidence-at least any that has been publically revealed-to suggest Prater has politicized the case. If Terrill has such evidence-beyond the simple fact that Prater is a registered Democrat-then he should produce it. The criminal aspect of the case is important. Just as important is the question over whether Terrill’s and Leftwich’s alleged actions represent business as usual at the state Capitol regardless if a crime was committed or not. If this is the case, then there needs to be expanded investigations. 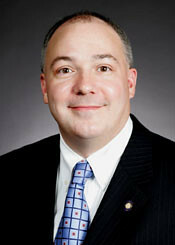 Fortunately, State Rep. Mike Brown, (D-Tahlequah) has called for a House investigation of the case. Such an investigation is prudent and necessary and shouldn’t necessarily be limited to Terrill. Again, here’s the main question: Were Terrill and Leftwich, if the information against them is true, just acting in a status quo fashion or was it a renegade act outside the normal political milieu? If, as Terrill argues, the charge is politically motivated, then where is the evidence? The people of Oklahoma deserve answers. « On Shame As A Tactic, Or, Betsie Gallardo: She Won…And So Can You! The Ok County DA must act on the information he has and the grand jury approved. Now the trite counter attack by Randy is expected and certainly weaker than I expected. The Oklahoman has not revved up its engines of smear and lies but I expect them to as the trail date nears. I am embarassed by Randy and appauled that he has a constituency that supports him. What does that say about the Oklahomans in his district that elected him? Sad state of affairs, if you ask me, and gives me reasons to leave the state I’ve lived in 60+years.